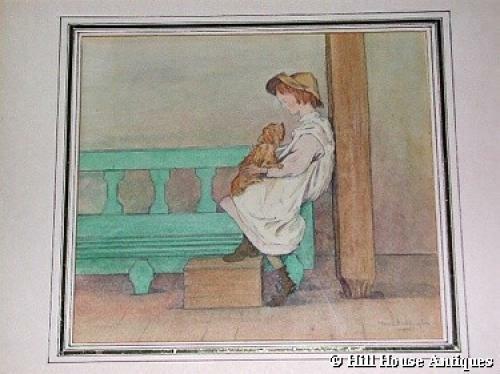 A charming small watercolour of a young girl and dog on a bench by Maud Beddington. Maud Beddington was a painter of children and fairies and flourished between 1895 and 1922. She was an admirer of Burne-Jones and this shows in the somewhat hauntingly innocent look in the childs face. She actually was a member of the Burne-Jones-Morris circle and was a neighbour of Burne-Jones in Bennets Hill, Birmingham when he was very young. She was also a friend of arts & crafts architect designer WAS Benson, who subsequently designed some cottages for her and her sister Beatrice in Winchelsea, Kent. She also designed textiles and is recorded as having done so for William Sleath, one of the main tapestry weavers for Morris & Co (see Textiles of the Arts & Crafts Movement by Linda Parry). Signed and dated 1915. For more information on the Beddington sisters please refer to the recently published WAS Benson book (Antique Collectors Club).